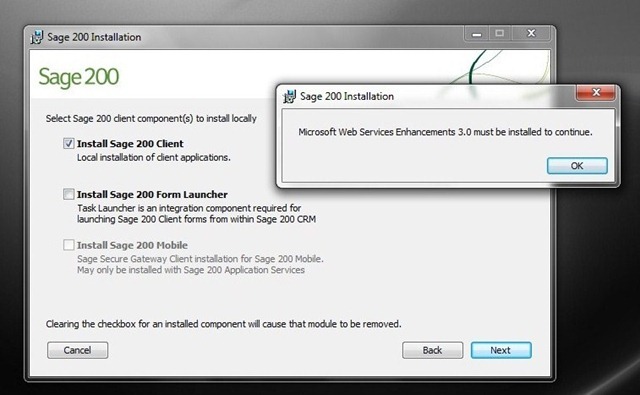 I recently had some difficulties installing Sage 2010 on Windows 7 (32 Bit). A couple of machines were complaining about Microsoft Web Services Enhancements (see Screen Shot). It’s easy enough to resolve. Install “WSE 3.0 Runtime” from the WSE3_0 Folder on the Sage 2010 CD before running the Sage 2010 Setup Routine. Note: it is possible to download WSE 3.0 from the Microsoft web site, but you must use the version provided on the Sage CD to resolve the problem.